HT800 v2 Series UL Intrinsically safe. For those requiring an entry level portable, with a no compromise MIL-STD810 C/D/E/F build specification, the 16 channel entry level HT8X2 is the most cost effective solution. From an established generation of commercial grade portables, the HT Series 2.0 is designed to operate in the most hostile environments and with its exceptionally loud audio, is the choice of the fire & rescue services and major blue-chip petrochem organisations worldwide. Utilising the latest intelligent Lithium-Ion battery technology with battery cycle count* the entry level HT8X2 will even alert you to imminent battery life expiration. 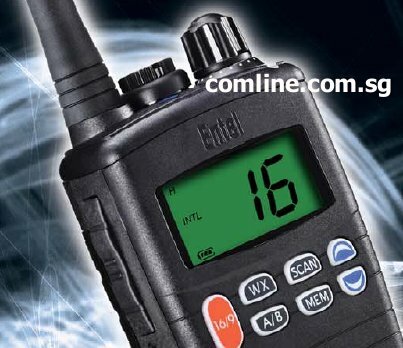 This low cost entry level model is simple to use, yet highly specified, offering features such as channel scanning, and local personal attack alarm, with optional Bluetooth communications facility and variable point voice scrambler - exceeding the expectations of even the most experienced radio users. Intrinsically Safe, USTC approved to Class I, II, II, Div I Groups A to G, T4. HT-848 - Entry-Level 16-Channel Marine VHF Fully Intrinsically Safe and GMDSS Approved.